Florida SouthWestern State College is pleased to offer the Purchasing Card Program to faculty and staff. 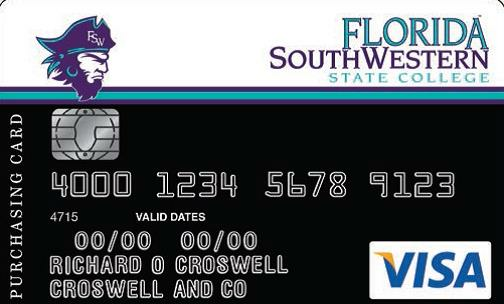 Welcome to the Florida SouthWestern State College (FSW) Purchasing Card Program (P-Card). This program is designed to provide a more efficient means of making routine purchases and payments. P-Cards, afford cardholders the convenience of purchasing directly from merchants without having to go through the purchase order, check request or reimbursement process. Using a P-Card streamlines the purchasing process, saving time and reducing paperwork. The P-Card is intended to complement the purchase order process and not replace it. FSW utilizes the Visa Network secured through Bank of America to provide the P-Card Program. In addition, all charges are reviewed, reconciled, and paid through the P-Card module of Banner Finance. P-Card transaction activity is updated daily in Banner. A P-Card may be presented to any merchant who accepts Visa, and after the purchase is made, your Reconciler will utilize the P-Card module of Banner in order to assign P-Card charges to the proper College funding source. Each department’s budget is allocated by INDEX codes. An INDEX is connected by a FOAPAL. You will need to become familiar with the Index and Account Code associated with your P-Card(s) to ensure purchases are being paid for with proper funds and expensed to the correct account code. A FOAPAL is the accounting string that is associated with a department’s funding source; it is an acronym for “Fund, Organization, Account, Program, Activity, and Location”. Success of the P-Card Program relies on the cooperation and professionalism of all personnel associated with it. As a Cardholder, you are expected to follow appropriate state laws and guidelines, as well as use good and reasonable judgment when making P-Card purchases. It is important to familiarize yourself with the information enclosed in this manual before signing the Cardholder Agreement Form (BO-057) and beginning to make purchases with your P-Card.